Gregor is a persona set in the late 1400s/early 1500s – a toast to the German renaissance fighting man. I have adopted this persona to attempt to get a glimpse into what is was and how it felt to live in the time of kings and castles. Over the next many months I shall be writing various articles relating to the medieval man-at-arms. This will include articles on medieval combat (S.C.A. 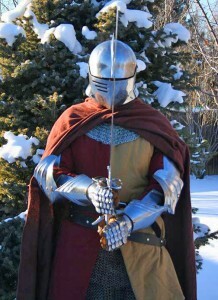 as well as historic) armor working, matters of honor, and medieval life. This blog will grant me the opportunity to share my various projects with anyone interested – projects that will be focused on doing things as historic as possible without sacrificing the safety of myself and others… nor the common sense and practicality that modern materials provide. Alright, Gregor, I love you dearly but this page is terribly out of date! You’re not good at boasting about yourself or your accomplishments (unlike me! ), so I’m just going to have to take over here. Gregor is … the most amazing man I’ve ever known, period. Honorable, supportive, funny, playful, and kind. Oh, you want to know about his fighting? I’ve never seen anything like him — had I seen him fight before I met him, I’d have backed away verrrry slowly. What I like best about his fighting is how chivalrous he is on the field. He’s squire to Duke Dag Thorgrimmson is the sort of thing I should probably tell you. Gregor is also a marshall, fencer, archer, and has an inordinate interest in authentic, amazing garb. He is my champion. I now return you to your regular programming! I love this photo of you! I would like to post a link to your sunshade piece into our Barony’s blog. We are in Trimaris, the Barony of Castlemere (Jacksonville area) and I am the Chronicler so I would need the permission to use with the digital box checked that should be in every kingdom’s chronicler forms online. If you can see your way clear to allow us to do that, I think the populace would find it helpful (we are a new barony, less than a year old). Appreciate your time. Permission granted. The only thing we ask is to get a copy of the newsletter in which the article appears. You can e-mail it to genoveva.von.lubeck (at) gmail [dot] com. I am e-mailing the release form to you.